I'm surprised to say that this January has been pretty good! I'm surprised because I normally find January to be a pretty depressing month where I never end up doing a great deal. I really don't think that i've ever had such a positive start to a year which feels amazing to be able to say. I kicked off January in style with an impromptu trip to London on New Years Day and I felt so incredibly lucky because Mr Kirby had booked us a nights stay at the Shangri La Shard! I never in a million years thought I would ever spend the night in London's tallest sky scraper and it really was an incredible stay. Our room was beautiful and luxurious and we were treated like VIP's from the moment we arrived. We also enjoyed our first heated toilet seat experience which I have to say was a bit of a life changer! Who knew a heated toilet seat could feel so good!? Everything was wonderful and it was so nice to just chill out, enjoy a swim with a view and of course order in some room service. I wish I could do it all over again! It was the perfect start to 2016. Oh, and did I mention the view from our room? After Christmas and at the start of the year it seems like everyone is excited for the January sales but I have to say that I never really feel an urge to really throw myself into them, especially on foot and in person. This January though I did find myself exploring some of the sales online and I did manage to pick myself up a few bargains including some pretty stationery from Kikki.K, a new purse from Matt & Nat (whose sale was amazing by the way - definitely something to remember for next January) and a lovely 'Peace, Love & Avocados' vest from the Deliciously Ella sale. This month has been surprisingly pretty busy and after a hectic Christmas I really wanted to make sure that I practised some self care so as to not completely burn out. This has involved some colouring, quite a few long baths and naps on the sofa. It also led me to consider how I and others can be prone to feeling low in January so I decided to put together my own 'Beat the January Blues' blog post where I shared some of my own wellbeing tips which promote better mental health. It definitely helped me to focus on and remember the things that I should be doing to help my mood not sink and I think it really worked this month as i've really felt mostly positive. January is often a time when people don't feel like being very social possibly due to the financial hangover of Christmas, or maybe new year diets and sobriety. However, this month has been fairly active for me and i've really enjoyed playing host to a couple of get togethers including a vegan afternoon tea and a vegan dinner party all under my own roof. I feel so fortunate that the powers of social media have bought me together with some lovely likeminded people within my area who i've truly become great friends with. After all of the over indulging at Christmas and completely falling out of my usual routine I've been really pleased to 'get back to normal' again. I think it was in the first week of January when I realised that I hadn't eaten an avocado for what felt like weeks and I could almost feel my body crying out for some of the heavenly green goodness! I soon put that right and got back onto one of my all time favourite lunches - avocado on toast with a sprinkle of paprika & side salad. I've definitely eaten out more than I planned to this month too. It's always difficult to just go back to normal after all the going out in December and it's amazing how quickly eating out every day can just become a part of the norm. That being said, it was really great to make a return visit to one of my local vegan hot spots The Den at 23 in Colchester. It's the perfect little spot to enjoy some lunch and, since working from home, it does just feel really good to get out of the house and enjoy lunch in different surroundings and have some human contact! The Den also have a new menu which I was excited to try out and I can highly recommend the 'Messy Mexican Burger'. It's great to see that this little cafe has clearly become a hit with the locals and even some meat eaters too! I also had the opportunity to visit somewhere which has been on my hit list for quite a few months - the Toby Carvery. If you didn't already know, the Toby Carvery now features three vegan dishes on their menu which is really quite applaudable for such a carnivorous restaurant. However, my experience of dining there had it's pro's and con's which you'll have to read my review to find out more about! A real highlight of this month has been getting to grips with my new DSLR Canon 750D camera. I made the decision at the start of the year that I really wanted to pursue my passions more and a huge love of mine has always been photography. Until now I've just relied upon my iPhone 6 Plus as my main camera and to be honest it's a really good camera which has served me well, and it's definitely one that I shall continue to use. But in order for me to really improve my blog photography and start to move forward with things I needed a more professional set up. Since owning this camera i've really started to take more pride in my photographs and their set up. I put much more thought into the compositions and consequently spend a lot more time photographing in general. It's also led me to be really proactive in ticking off some of my 2016 goals and i've already signed myself up to a photography and a photoshop course which I can't wait to start in February. Everyone knows by now that I am a huge fan of subscription boxes and one of my blog goals for this year was to move away from one subscription and review multiple different boxes instead. This kicked off pretty well in January with me reviewing both the LIFEBOX and the Buddy Box. Overall this January has to be the best month to date for my blog, which also happens to celebrate it's 1st birthday around about now! My following has been growing rapidly each day which is always amazing to see and my post hits are always on the increase which really does make blogging feel all the more worthwhile. After all, it's great to see that people are looking at and reading my posts as well as leaving me some positive feedback. One post which caught a lot of people's attention this month was my Open Letter to GBK following their rather dissappointing advertising campaign mocking vegetarians and vegans. To celebrate The V Nice Life turning 1 I decided to give the blog a little makeover. It felt pretty nerve wrecking deciding to completely change the look and format of my blog but at the same time I do get bored pretty quickly and I felt the time was right for a new look. I hope you all like it too! The creative juices have certainly been flowing this month and it hasn't stopped with writing and photography. For some unknown reason I was overcome with the desire to do some home decorating! This really doesn't happen very often and I think maybe taking a peek at some home inspo pics on Insta fuelled my need to get the paint brushes out. Sadly it didn't go completely to plan with us initially choosing the wrong colour paint which we didn't fully realise until we had painted our entire hallway. A little frustrating to say the least! Anyway after a second visit to the paint shop and a new colour in hand we finally achieved the colour we were hoping for and Farrow & Ball's 'Mizzle' came to the rescue. With Valentines Day around the corner I decided that I wanted to surprise my husband with a family portrait. I follow quite a few different artists and illustrators on social media but someone who I have adored for a long time is Viktorija from And Smile Studio. Her work is just so beautiful, simple and fun! I instantly know when I am looking at one of her illustrations as her style is so individual and recognisable. Her Instagram feed always makes me smile and i've been longing for a piece of her work and my own portrait for some time now. I'm so incredibly happy with the family portrait she created for me which of course had to include our beloved pets. I love it so much that I couldn't even wait until Valentines Day to show my husband so this portrait has now taken pride position on our wall for everyone to see. Mr Kirby was pretty bowled over by it too! Back in December my husband had bought me a spa break for my birthday which we decided to book for the end of January. January can often be a bit bleak with little to look forward to so it's been nice to actually get away this month and do some different things. We stayed at the beautiful Charlton House Hotel in Somerset which has the most amazing spa. It was so lovely to just relax, enjoy the facilities and explore the nearby city of Bath. We had hoped to do some of the touristy sights like the Roman Baths but unfortunately it rained so bad the whole time we were there that we only managed to enjoy some retail therapy and vegan eateries - which I shall be sharing with you all soon! How was January for you? I hope you all had a great month! I heard about the new vegan options at the Toby Carvery some time ago now and ever since I have been meaning to get myself over there to try them out. I'm not really sure why this has taken me so long but it's possibly due to the fact that I really have to be in the mood for a roast dinner. It's something that I know so many people say is their favourite meal which they could eat every day but it's definitely more of an 'every now and then' kind of dinner for me. It's also something I only really happen to enjoy during the colder months. I first became aware of The Blurt Foundation through Twitter and after seeing one of their thought provoking and highly relatable messages about depression. One of the reasons why I love Twitter so much is because so many people speak openly and honestly about their mental health problems. I believe that this ultimately helps to break down the stigma attached to emotional illnesses, whilst also offering some comfort and support to other sufferers. Blurt are dedicated to helping those affected by depression and from the moment I took the time to read more of their tweets and their blog I knew that they really and truly understood what it actually means to struggle with depression. I've sadly experienced periods of depression in my life and it's a sad fact that only those who have also been through it really understand what its like, how it makes you feel and what a devastating impact it can have on your life. It's so much more than feeling low or a bit down and sad. When depression strikes at its worst it can be completely crippling by crushing your self esteem and effecting your ability to get up in the morning, hold down a job, maintain friendships / relationships and even leave the house. This is something the Blurt founder and CEO Jayne Hardy knows all too well. Having been diagnosed with depression herself she recalls - 'the isolation was crippling and in time, I was too scared to leave the house'. 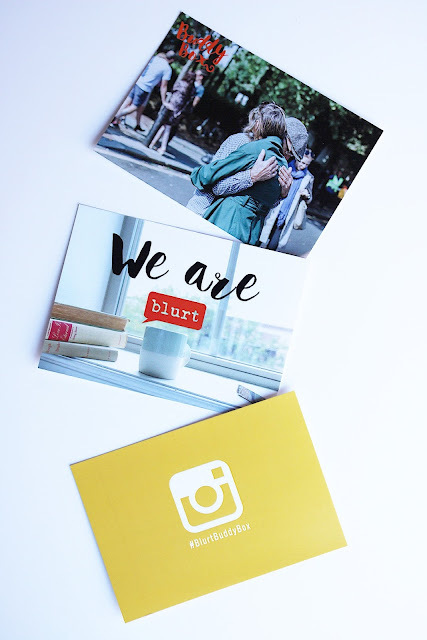 It's fantastic to see how dedicated The Blurt Foundation are to raising awareness about depression and the help that they offer to those affected by the illness. Along with their tweets and blog they also offer informative resources, a support database, podcasts and a peer to peer support group. As if all of that wasn't enough they also come up with the Buddy Box, aka 'a hug in a box'. If you follow my blog you will already know how much I love happy mail, in particular subscription boxes, so as soon as I saw the Buddy Box I was curious to learn more. The Buddy Box is designed to be a little box of self care to help anyone who may be struggling. I instantly fell in love with the whole concept of a subscription box service dedicated to this as, since my own experiences with anxiety and depression, I have learned the hard way the importance of self care to promote positive wellbeing. This is also something that I advocate on my own social media accounts and blog. 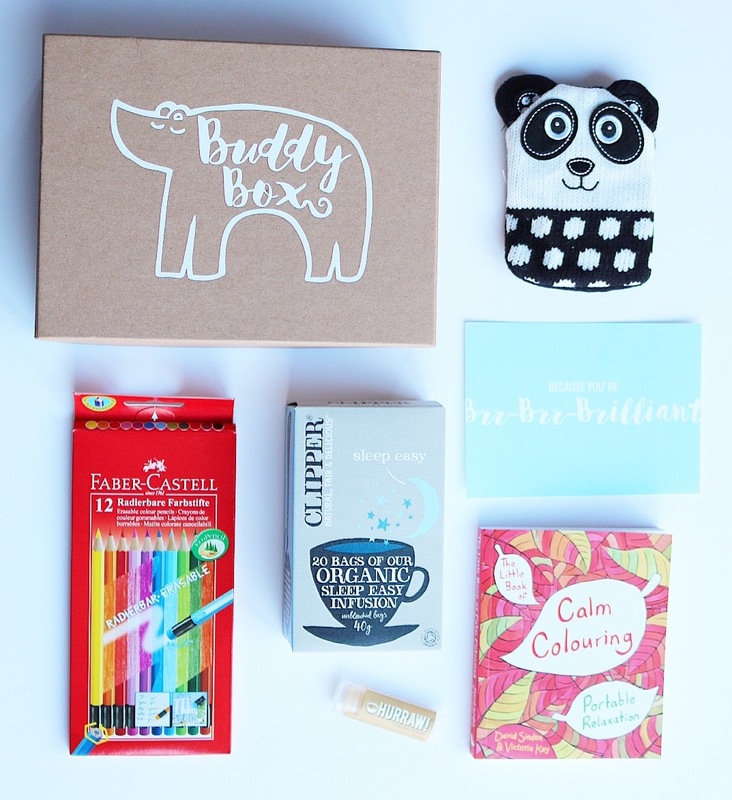 The Buddy Box is also a great idea because not only can it work as a treat for yourself but also as a gift to someone who you know may be in need of a little boost. I know from experience people can often struggle to know what to say and do when they know you are struggling with any emotional health problem. In some ways, and despite all the openness on social media platforms, it can still be somewhat of a taboo subject which people often find difficult to address. By sending someone a Buddy Box it's the perfect way of letting them know that you're thinking about them and that you care. I know I would love to receive one of these in the post at any time but I also know how much it would mean to receive one when you're at your lowest. 2016 is the year of being kind to myself and so as a little new year treat I decided to gift myself a Buddy Box. Ok, there's no denying that it would have been lovely to receive one as a surprise in the post from a friend, but rather than waiting for that day I decided that I needed one in my life right now! And I guess that's the thing about self care. It's caring for yourself! It's doing happy and nice things for YOU to make YOU feel good. When I looked at all the contents of this box it felt very spooky as if they really knew me and what I like! It made me smile a lot. I'm a big fan of colouring for calmness and relaxation so it was nice to receive some new pencils and a mini colouring book which is such a handy size for carrying around with me. I was also happy to receive a new box of tea bags which I haven't tried before and I love that they are supposed to help with sleeping. I'll look forward to a cup of this tea in the evening before bed. Hurraw vegan lip balm is already a favourite of mine and I already have this exact flavour on my bedside table so yay for more lip balm! And you're probably wondering what the little panda is? Well it's a lovely little hand warmer which just so happens to be very cute! There are multiple different options for subscribing to a Buddy Box which means that you can get a surprise box of treats just like this every month. A reoccurring monthly subscription costs £21.50 but there are cheaper options if you pay in full upfront for 3, 6 or 12 months. Alternatively you can do what I have done and buy a one off box for yourself or a friend for £21.50 (free postage). There is also a Buddy Box Lite which contains 3 full sized items instead of 5 for £12.00 (free postage). The Buddy Box is the perfect way to say I care whether it be to a friend, family member or most importantly yourself. It encourages you to take some time out away from any stresses for yourself to relax. Stress was a major contributor towards my own anxiety and depression and if I could change anything I wish someone had stopped me and encouraged me to slow down and look after myself. Have you been lucky enough to receive a Buddy Box yet? 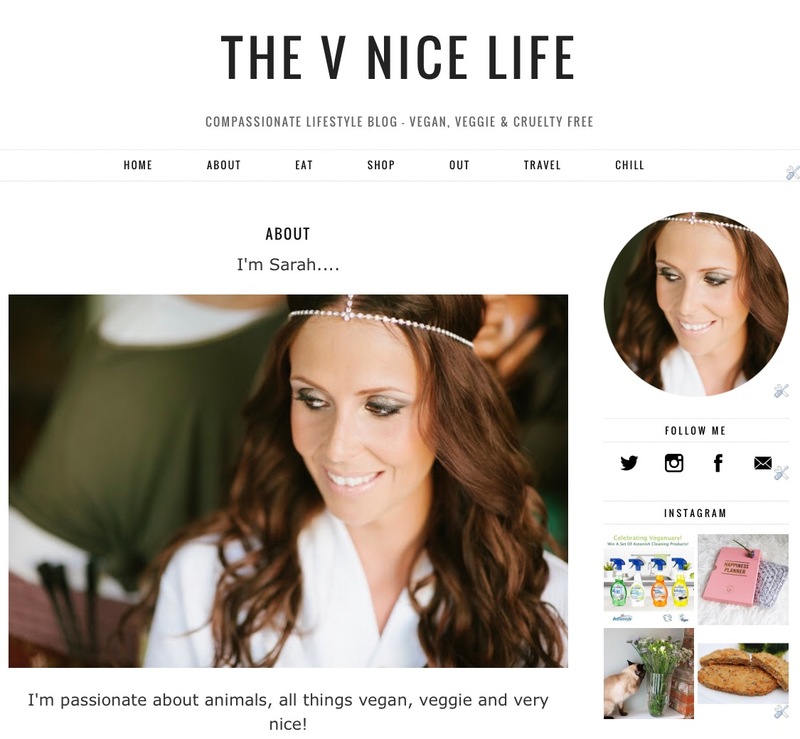 * The V Nice Life is a compassionate lifestyle blog which predominantly focuses on vegan and cruelty free living but also promotes compassion and awareness around mental health issues. Compassionate living encompasses all areas of empathy towards living life, humans included! The Buddy Box cannot guarantee that the contents of these boxes will always be vegan friendly. This box was purchased by myself and all views expressed within the review are my own. The lovely people at the Vegan Lifestyle Association recently got in touch with me and asked me to review a couple of new vegan products from Fry's which I was more than happy to help out with. In the past I haven't really tried a great deal from the Fry's range so I was really looking forward to getting to know the brand a bit better and a taste for their products. In a change to my regular routine I have decided to mix things up a little this year and try out a number of different lifestyle and subscription boxes. As many of you will know I cancelled my beloved Vegan Kind subscription box at the end of 2015 after being a loyal customer for over a year and as sad as I was to do this I was also excited to find out what other boxes were out there on the market. Cleaning products may often be a slight after thought when making the move over to a vegan and cruelty free lifestyle. I know from my own experience that I first tackled food and my eating habits and the next priority was to look at my beauty products and cosmetics. It was months down the line before I started to research and make better decisions around my household products. And there's nothing wrong with that. Completely changing every aspect of your lifestyle is such a huge transition which can feel really overwhelming at times so I found it more practical to tackle it one piece at a time. Ultimately you have to just do what works best for you and, despite how others may make you feel online, there is no rule book! I'll admit that a big factor for me when choosing what products to use is ease and convenience. Probably like most of you reading this, I like to do one big weekly shop online where I buy all of my food and household products in one go. I also only ever tend to shop between three supermarkets - Tesco's, Sainsbury's and Ocado. However, since their highly irritating series of Christmas TV ads Tesco's haven't seen a great deal of me recently! Convenience is a big deal for me and although i'm sure there are countless wonderful products available at other smaller and independent shops, I really don't want to be ordering from numerous different places. Over the past year I have tried a number of different vegan and cruelty free household products, from small independent businesses and including the bigger more well known brands such as Ecover, Method and Ecozone. It's great to see so much choice now within this section of the supermarket as I'm sure when I first went vegan there really wasn't a great deal to choose from and anything which was friendly to both animals and the environment was undoubtedly three times the price of my regular products. Recently i've found myself shopping more and more from Ocado as their choice for vegans is in my opinion the best. Their website is also always very clear about what is suitable for vegan consumption where as others like Tesco's can often get this wrong which can be really frustrating especially when you're shopping online and unable to read the back of the box. I'd heard some really good reports online about Astonish cleaning products and I was pleased to see that they were available to buy from Ocado. I decided to order myself a range of their products to try for myself and I was instantly impressed by their prices with the vast majority of items coming in at under £2.00. Overall I picked up some Super Concentrate Non Bio Detergent Lavender & Ylang Ylang for £1.99, Lemon & Ginger Antibacterial Washing Up Liquid for £1.00, Antibacterial Spray for £1.35, Silke Soft and Clean & Protect Hand Wash both for £1.39 each. It's been a few weeks now since my new cleaning products arrived and i've been able to put them all through their paces at home and form some opinions. First and foremost I am always a big fan of any vegan and cruelty free product which has the all important stamps of approval on their packaging. I'm pleased to say that all of the Astonish products are both Cruelty Free International and The Vegan Society approved and certified. You can have a little read of Astonish's commitment to producing cruelty free products here. The product that I have been most impressed with would have to be the laundry detergent. It smells incredible, goes a long way and has done a splendid job of both cleaning and softening my laundry. I would usually spend well over £5.00 on laundry capsules in the past so this is a really great find. The washing up liquid has been equally as impressive. The lemon and ginger fragrance is really fresh and zingy and importantly it has done a good job of cutting through the dirt on the dishes. I also really like how the lid faces downwards as it means you get every last drop out of the bottle. I tend to use my dishwasher more than I do hand washing up so i'd be really interested to see how the Astonish dishwasher tablets compare. The antibacterial spray really appealed to me because it can be used in your kitchen, bathroom and on most food surfaces. I usually buy a separate kitchen and bathroom spray so it's really handy to have one product for all uses which is effective in killing germs. The bottle is a big 750ml and towers above my usual 500ml bottles in the cupboard which makes it even greater value for money. I was also so happy to see that 4p from this product will go towards helping Astonish raise £10,000 for the RSPCA in their current promotion. Hand wash is a product which I seem to buy a lot of as I use it in my kitchen, bathroom and downstairs toilet. I like to use anti bacterial hand washes at home so it was great to see that all of Astonish's hand washes are anti bacterial and come in a variety of colours and fragrances. I chose to buy Silke Soft and Clean & Protect and my first impressions have been very good. The bottles look really smart and quite fancy with their silver tops. They remind me of the nice Bayliss & Harding bottles of hand soap I used to use. Silke Soft has a pleasant subtle fragrance whilst Clean & Protect is bursting with a wonderfully fresh fragrance which screams clean at me! I can't fault either of these hand washes but with other flavours such as Chocolate Orange and Cranberry & Cinnamon i'd be interested in trying others from the range until I find my firm favourites. And did I mention that they're a British company? All the views expressed within this review are completely my own and the products were purchased by myself from Ocado. This post is in no way sponsored by Ocado or Astonish.